Don’t forget to enter to win a copy of Everyday Happy Herbivore by the Happy Herbivore herself, Lindsay Nixon! Contest runs until Friday, so get your entries in! As far as weather is concerned, we continue to be lucky here in the Northeast this winter. January is usually the month for bitter, biting cold all the time–and we’ve only had a couple of cold snaps, each lasting a day or two. But it’s definitely still winter, and when you’re a foodie winter means a lot of comfort food like soups, chilis, and stews. Stew is a go-to meal for me when I’m craving something warm and filling, and whenever I’m craving potatoes. There’s something about big, soft chunks of potato in thick broth that says comfort to me more than almost any other food. But when I want stew, I’ll admit I’m not terribly adventurous and tend to default to the stew with dumplings recipe in 30-Minute Vegan. Lately, though I’ve been wanting winter vegetables in general (blame it on the parsnips I found at the co-op), so I broke the cycle and went looking in other books for inspiration. 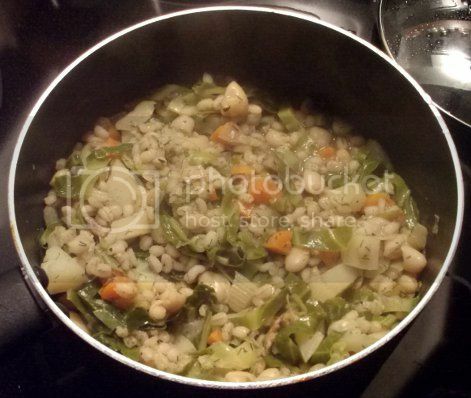 1,000 Vegan Recipes turned up a barley and veggie stew recipe that struck my fancy as soon as I read the ingredients: onions and carrots, barley and white beans, the ubiquitous potatoes, and, surprisingly, cabbage. Though I often use it on sandwiches and in stir fries, I’ve never put cabbage in stew before. But as I often say, I’ll try anything vegan once, so I popped by the grocery store, grabbed a head of green cabbage, and gave it a shot. All I can say after having it is that cabbage = WIN in stew! It provided a bit of green crunch to offset the softness of the potatoes and white beans and complement the chewiness of the barley. 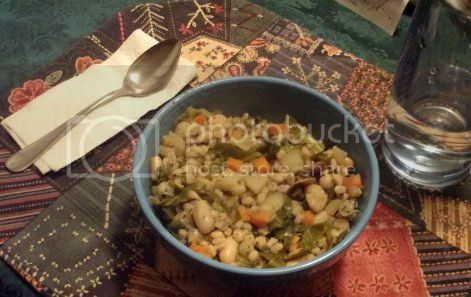 In fact, the mixture reminded me a lot of vegetable barley soup, which it very well could have been with the addition of more broth. This is a really good stew, especially on chilly days. There are probably better words to describe it, but I think the ingredients speak for themselves. I liked the addition of the white beans as the protein source, but if you like your stew to be a bit more, um, “meaty,” chopped seitan would work, too. You’d have to brown it first to get the texture right, but I think the overall flavor would be nice. Question for the comments: What’s your favorite “go-to” vegan stew?